If you’re looking for Aston Martin finance, we at Aston Martin Newcastle can help put together a package that suits your needs. Finance is available on both new and pre-owned Aston Martin vehicles, as well as used non-franchise stock, with competitive deals on offer across the board. We take into account your available deposit, part exchange and preferred term of contract to create a package that meets your requirements. Affordable repayment structures mean that a new Aston Martin could be more attainable than you think. We frequently have a selection of finance promotions available across the new Aston Martin range. These offers look to help the buyer out with such advantages as deposit contributions and low interest rates (subject to availability), whilst also giving you a good idea of how an Aston Martin finance package might look. Personal contract purchase (PCP) - Perfect for those after flexibility, PCP finance gives you low, fixed monthly payments and the choice of what you’d like to do with the car come the end of the contract. A PCP deal starts with you paying an initial deposit or part exchanging your current vehicle to cover this, then monthly payments start and last the duration of the contract. These payments are cheaper in a PCP deal, compared to a Hire Purchase package, as you only pay to cover the depreciation rather than to own the car. At the end of the contract, you’ll have the choice to pay what is called the GFV (Guaranteed Future Value) and make the car yours, refinance the GFV and start monthly payments once more, use any equity in the vehicle to put towards a new car or simply hand the car back. Hire Purchase (HP) - If you’re certain you’d like to finance your Aston Martin and own it at the end of the contract, then HP finance is likely to be for you. Like a PCP deal, you start by paying a deposit or using a part exchange to cover it, and you pay fixed monthly payments until the end of the contract. However, at the end, you will own the car and there are no large one-off sums to pay, nor do you have to worry about equity in the car or handing it back - the car is yours. Contract Hire (PCH/BCH) - The other end of the scale to HP is Contract Hire, ideal for those who want a short-term contract and wish to pay for the use of the car and then hand it back come the end of the agreement. A Contract Hire deal can be done on a personal basis or a business basis, hence Personal Contract Hire (PCH) and Business Contract Hire (BCH). The structure basically sees you pay an initial sum then monthly payments until the end of the contract, and as you’re paying to cover the depreciation of the car and not to own it (like PCP), these payments are lower. Unlike a PCP deal, there is no option at the end to own the car; you hand the vehicle back and, if you wish, start a new contract. Finance example is for Aston Martin Select agreement for a new Aston Martin V8 VANTAGE S COUPE Manual 2dr (2012 - ), with a contract mileage of 18,000 miles and excess mileage charge of 27.18p per mile. 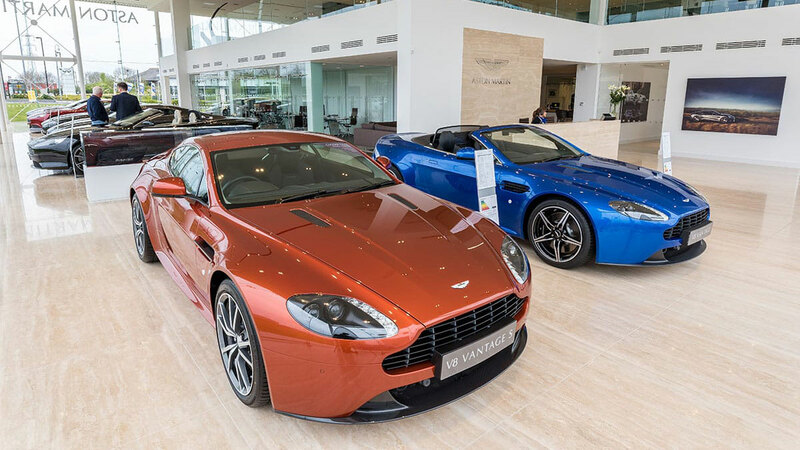 Applies to vehicles ordered at participating Aston Martin dealers between 01 October 2016 and 31 December 2016 and registered by 31 January 2017, (subject to availability). Retail customers only. *On the road cash price is based on manufacturer’s recommended retail price and includes 3 year Warranty, 12 months’ road fund licence, vehicle first registration fee, delivery, and VAT. ^Optional final payment and option to purchase fee not payable if you opt to return the vehicle at the end of the agreement (vehicle condition, excess mileage and other charges may be payable). Finance available subject to credit acceptance to UK residents aged 18 or over. Guarantees and indemnities may be required. Terms and conditions apply. Offer may be varied, withdrawn or extended at any time. ‘Aston Martin Select Finance’ is a form of hire-purchase agreement provided by Aston Martin Financial Services and Alphera Financial Services, both trading names of BMW Financial Services (GB) Limited Summit ONE, Summit Avenue, Farnborough, Hampshire, GU14 0FB. You will have a 14 day statutory right to withdraw from the agreement.